The longest aisle in the supermarket is the breakfast cereal aisle. It seems to stretch forever with boxes of so many colors and sizes. How is a person to choose the healthy option? Obviously, Trix looks more like candy than cereal. It advertises "2 Fruity Colors in Every Puff" and yes, those are created by Yellow #6 and Blue #1. We nicknamed Trix "candy cereal" because of its likeness to, well, candy! But, General Mills states that Trix is made with whole grain, and it is a good source of calcium and Vitamin D. Is it good for you? My friend, Hemi, over at Cereal Scan has built a great iPhone App that will evaluate your cereal. You scan in the bar code and it gives you an objective evaluation of whether the cereal is healthy. If the cereal is unhealthy, it recommends similar cereal that is better for you. Isn't that cool? For the rest of us that don't have an iPhone, there are some simple things to evaluate about the ingredient list that will help you decide if the cereal is a good choice. 1. Is the first ingredient whole grain? 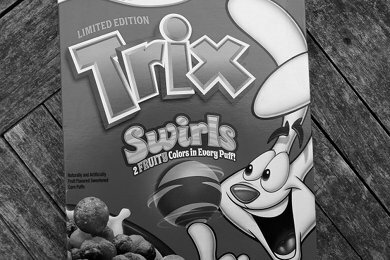 Trix's first ingredient is whole grain corn. So, Trix survives this test. 2. Is sugar, high fructose corn syrup, molasses, honey the second ingredient? Trix fails here with sugar being the second ingredient. 3. One serving must provides at least 4 grams of fiber. You can remember this one with Four Fiber. Trix has one gram per serving. So, Trix failed 2 out of 3 and is not a healthy choice (duh). Let's try again with a potentially healthier option. I have a box of Target brand Rice Krispies in my cupboard. The first ingredient is rice. This is tricky - is this whole grain? Well, if it was brown rice it would be whole grain, so the answer to #1 is no. The second ingredient is sugar - so #2 is no, and it has zero grams of fiber. The rice cereal did worse than Trix!! Why do these measures matter? All three of these factors are about how nutritious the cereal really is - no matter what the box tells you. Whole grain is better for you because the more nutritious part of the grain is included (see Homemade Wheat Bread. Too much sugar means that it will burn quickly in your body and you will have a crash before lunch (and need a snack). The amount of fiber is also a reflection of how long it will take your body to process the cereal. You want your cereal to stay with you for a while providing you what you need for your morning. What to do if you love a crappy cereal? Mix it in with a healthier cereal so you don't feel deprived. Obviously, I own these two boxes of cereal and I deal with my children demanding crappy cereal. Just like any other treat, I just use less of it and I don't count on it every morning to provide my family sustenance for their day. Please share your cereal evaluations below. I just avoid processed cereals altogether. It's much easier for me to use whole grains to make my own cereal than it is to rely on Big Food. just eat your no-bake oatmeal cookie with coffee breakfast done! We have all those sugary cereals in the cabinet too... but my 9 year old son has lately been into Multigrain Cheerios and Wheaties (he thinks he will do better in baseball if he eats them - fine with me.) He likes them with sliced banana. For "kids" cereals they are lower in sugar than most - I'll have to check against your other criteria as well. I find most cerals to me high in sugar or high in sodium. My favorite breakfast snack is a granola that is made by a local store. They have great whole grain breads and the granola is awesome. I really like yogurt with Grapenuts but I have to limit the amount of yogurt to do the milk. I wonder if that criteria always holds up... I just went and looked at what I have been eating and feeding my toddler to snack on lately. It is organic kamut puffs, which are 100% whole grain. There is absolutely nothing else to the cereal- just organic whole kamut. It isn't processed, it is just the steamed kamut kernal. However, by the above criteria, it actually fails the 4 g per serving rule. A cup of this cereal dry is whole grain, no sugar of any kind, and is 50 calories, yet it only contains 2 g. However, I can see it would be a good guideline when looking at the processed cereals. These rules are meant to be a guide - and there are always exceptions to rules. I think the Kamut puffs are really great. I mean they passed 2 out of 3 - no? I love the cereals by Post... I always buy Honey Bunches of Oats (with Almond, Cinnamon, Pecans, Chocolate or Strawberries) or Post Selects (Banana Nut Crunch or Blueberry Morning) :D Yummmm-o! Fiber One Raisin Bran Clusters....all I have to say is Mmmmmmmmm! If you think whole grain is more healthy than not, research a bit on phytic acid and other anti-nutrients in foods. Grains are unhealthy, period. Unless you prepare them by soaking, sprouting or fermenting (sourdoughing), they will take more nutrition from you than they give. Fiber One, Fiber One, Fiber One ... best price is at Target (you'll save about 90 cents per box versus other supermarkets). If you have a Trader Joe's by you, it sells an excellent fiber cereal too. Now add blueberries, strawberries, raspberries, bananas, blackberries...and you will have an incredible breakfast or snack...that will fill you up for hours. Try it with almond milk. I love all of the Barbara's Organic Cereals- they're a little pricey, but you get what you pay for! One healthy choice for breakfast is enjoying a bowl of oatmeal. It's especially good for people who have heart disease or diabetes. Also it's not only filling but also great source of fiber, has antioxidants that help prevent oxidation of LDL cholesterol and also boosts immunity. Our favorite way to enjoy our oatmeal is by adding blueberries and our cinnamon and truvia mixture although there's tons of ways to make oatmeal delicious such as bananas, strawberries, honey, cocoa, peanut butter...etc. I just came across this post from your current post. This is so fantastic! I crave whole grains more than sugar so for me it is easy to eat the healthier cereals, but I have four kids who are so picky. I will certainly start putting all our cereals to these tests! Check out this article about the 10 worst offenders! I mix sugar cereals with similar 'plain' ones for my daughter. And that was only after my husband gave her a whole bowl of sugar cereal once, not knowing that I'd just sprinkle some on the top for special treats - most days she ate her rice puffs, corn flakes or Cheerios plain! Argh! I got her back into the habit of just getting some sugar cereal sprinkled on top, or a little cinnamon sugar. I like the cinnamon sugar best because, like the kiddie cereals, it's more visible than just adding plain sugar on top. Most kids want you to keep adding sugar until they can SEE it, which is just too much! So I have a special high-cinnamon-ratio cinnamon sugar. And I've found that just cinnamon on my plain cereal is pretty good. For some reason it helps satisfy a sweetness craving, plus it adds flavor. And it's apparently good for diabetics in and of itself. I love Kelloggs Fiber Plus Antioxidants Cinnamon Oat Crunch. It has 9 grams of fiber and 7 grams of sugar. It reminds me my childhood favorite, Apple JAcks but not as sweet.